Posh striker Lee Angol has joined League Two club Mansfield Town. The 22 year-old hitman signed for Steve Evans’ side for an undisclosed fee today (May 18). 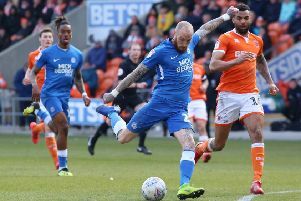 Angol joined Peterborough United from Luton in July 2015 - again for an undisclosed fee - and scored twice on his debut for the club in a 5–1 victory at Oldham on 12 September 2016. He went on to score 11 goals in 38 games for the club that season. Last July, however, Angol fractured his ankle in a pre-season friendly at Boston and required surgery to place a pin in his leg. After regaining his fitness he made eight starts last season and scored just one goal. In March he was loaned to National League club Lincoln City until the end of the season. He again scored a hat-trick on his debut in a 4–0 victory away to Braintree Town and completed the loan spell with 13 appearances and six goals. Upon his return to Posh, Angol was transfer-listed by the club. Mansfield chief executive Carolyn Radford said: “Full credit must be given to manager Steve Evans who has, over the last number of days, been able to convince young Lee that his future should be with us at Mansfield Town Football Club. “Both the chairman and myself have taken the opinion of many good judges in football which is clear that they see Lee as a player who should be playing in the Championship within the next two years and hopefully we can give him the platform to achieve that with our club.